Careful history and the examination will lead to proper investigation and from there to proper diagnosis and treatment. Department of Orthopaedics, Yenepoya Medical College Hospital, Deralakatte, Mangalore, Karnataka, India. Department of Orthopaedics, University Road, Deralakatte, Mangalore – 575 018, Karnataka, India. Aneurysmal bone cysts are blood filled fibrous tumour like cysts that expand the bone giving it a blown out appearance. It is usually seen in the second decade. Aneurysmal bone cysts were first described by Jaffe and Litchensen in 1942. The exact aetiology is unknown. One of the most widely accepted idea was that aneurysmal bone cyst was a consequence of increased venous pressure and subsequent dilatation and rupture of local vascular network. However, studies by Panoutsakopoulus et al and Olivia et al uncovered the clonal neoplastic nature of aneurysmal bone cysts. Here we report a case of aneurysmal bone cyst of calcaneum which is one the rarest site. Case Report: A 25 year old male presented with a history of trivial fall from a ladder and landing on right heel. He complained of pain and swelling. On examination, he had swelling over the medial aspect of right heel. Skin over the swelling was stretched and it was soft in consistency and tender. Curettage and bone grafting was done. Patient was pain free and was bearing weight fully on the operated limb, 12 weeks post operatively. Conclusion: Aneurysmal Bone Cyst of calcaneum although seen rarely, should be considered as one of the differential diagnosis in the cystic lesions in calcaneum. Curettage and bone grafting has stood the test of time as standard treatment. Keywords: Aneurysmal bone cyst; bone grafting; benign bone lesions; calcaneus; curettage. Aneurysmal bone cyst is an osteolytic bone neoplasm characterized by several sponge-like bloods or serum filled, generally non-endothelized spaces of various diameters . It is rarely seen in bones of feet. Controversy exists regarding optional treatment. Regardless of techniques reported the recurrent rates ranges from 5% to greater than 40% [2-8]. At present curettage and bone grafting or insertion of Polymethyl methacrylate are the principal techniques, [2-9] but in the past radiation has been used . In several other trials, sclerosing substances, bone substitutes and other agents seemed to be less effective than conventional curettage. Primary etiology probably is arteriovenous fistula within the bone . A 25 year old male presented with a history of trivial fall from a ladder (5 feet) and landing on right heel. He complained of pain and swelling. On examination, he had swelling over the medial aspect of right heel (Fig.1). Skin over the swelling was stretched and it was soft in consistency and tender. No relevant past history and family history in view of bone cyst and malignancy. No evidence of any risk factors. 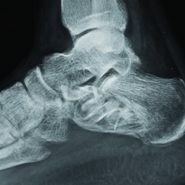 Radiograph of right ankle revealed an eccentric, expansile, cystic lesion of the calcaneum with thin septae traversing the cystic cavity giving it a blown out or soap bubble appearance. There was a cortical breach suggesting fracture (Fig 2). In our case we avoided CT/MRI due to the expense and we proceeded with biopsy and histopathological examinations, which is more informative. Patient underwent two staged procedure,first for biopsy followed by second procedure after confirmation by histopathological examination. Under strict aseptic precautions, biopsy was done under anaesthesia. The specimen was sent for histopathological examination and it was diagnosed by Pathologist as Aneurysmal Bone Cyst. 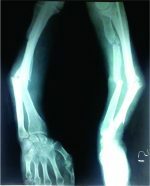 A differential diagnosis of aneurysmal bone cyst or giant cell tumour with pathological fracture was made. Under spinal anaesthesia and strict aseptic precautions, the lesion was curetted and the cavity was filled with iliac bone grafts (Fig 3, 4). The curetted specimen was sent again for histopathological examination and the diagnosis was confirmed (Fig 5). The wound was closed, dressed and below knee posterior plaster slab was applied. Post-operatively a non weight bearing crutch walking was allowed for 6 weeks followed by partial weight bearing for further 4 weeks. Follow up was done on 3rd and 6th month of post op (Fig 6, 7). Patient returned to his activities at the end of 6 months and we are still continuing the follow up, because the recurrence usually happens within 1 year. • Tibia and fibula: 24%. Recurrence usually happens within 1st year after surgery and almost all episodes occur within 2 years. Therefore a patient of aneurysmal bone cyst needs to be observed for at least this period of time to exclude any recurrence. Aneurysmal Bone Cyst of calcaneum although seen rarely, should be considered as one of the differential diagnosis in the cystic lesions in calcaneum. Curettage and bone grafting has stood the test of time as standard treatment. Any patient presenting with unilateral heel pain should be subjected to at least radiological examination during their first visit, instead of labelling them as plantar fasciitis. The cause for heel pain could be a benign lesion or a malignant lesion as mentioned above. Management protocol varies from lesion to lesion. 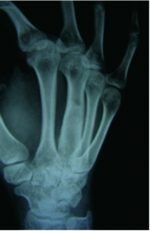 Further, early diagnosis can lead to early treatment and hence subsequent complications of late treatment can be avoided especially in aggressive bone tumors. 1. Maroldi, Roberto (2005). Imaging in Treatment Planning for Sinonasal Disease. Springer.p. 114. 3. Vergel De Dios AM, Bond JR,Shives TC, et al: Aneurysmal bone cyst: A clinicopathological study of 238 cases. Cancer 69:2921-2931,1992. 5. Bollini G,Jouve JL, Cottalorda J, et al: Aneurysmal bone cyst in children: Analysis of twenty seven patients. J Pediatr Orthop B7:274-285,1998. 6. Campanacci M, Cervallate C, Donati U, et al: Aneurysmal bone cyst: A study of 127cases,72 with long term followup. Ital J Orthop Traumatol 2:341-343,1976. 10. Feigenberg SJ,Marcus RB Jr,Zlotecki RA, et al: Megavoltage radiotherapy for aneurysmal bone cysts. Int J Radiat Oncol Biol Phys 49:1243-1247,2001. 11. Pediatric Orthopedics in Practice. Springer. 2007. pp. 151–155. 12. Campanacci m:Aneusymal bone cyst, in Campanacci M(ed):Bone and soft tissue tumours(ed 2).New York,NY,Springer Verlag,1999,pp 812-840. 16. Kransdorf MJ,Sweet DE.Aneursymal bone cyst:concept,controversy,clinical presentation and imaging.AJR Am JRoentgenol.1995;164(3):573-80. 17. Chowdhry M, Chandrasekar CR, Mohammed R, Grimer RJ. Curettage of aneurysmal bone cysts of the feet. Foot Ankle Int. 2010 31(2): 131-135.